Introducing: Butch and Kim Polston of B&K Enterprises Costume Company Inc.
B&K Display Room, showcasing the exquisite Elvis jumpsuits made at B&K Enterprises Costume Company Inc. Photo Credit: Butch Polston. “I buy my jumpsuits from B&K Enterprises…if you want the best, you have to order from B&K Enterprises.” ETA Oliver Steinhoff, SIDEBURNS Magazine, December 26th, 2017. Butch and Kim Polston at the Blackpool show. Photo Credit: Gene Doucette. The questions that I prepared for Butch Polston’s interview focus on Butch and Kim’s company, B&K Enterprises Costume Company Inc. ETA Oliver Steinhoff’s statement that B&K are “the best” intrigued me, so I created questions to find out why B&K Enterprises are considered the best manufacturers of Elvis costumes in the world. Butch’s answers treat readers to a behind-the-scenes look at what goes into making their beautiful Elvis costumes and running a very successful company. Subsequently, Butch addresses the question of why Oliver claims B&K are"the best". But after reading and re-reading Butch’s answers to prepare his interview for posting, I realized that I learned just as much about the “B” in B&K Enterprises, as I did about the "Enterprises" part of their company. Butch’s answers reveal his strong work ethic and integrity, his love for his family and friends, and respect for his parents. Butch spices his answers with bits of humour, and reveals that he is an artist at heart. I take great pleasure in introducing Butch Polston to SIDEBURNS followers. I wish to thank Kim, the “K” in B&K Enterprises--and Butch's wife, for her assistance in setting up this interview while Butch was in Birmingham, UK. Kim is an integral part of the story behind B&K Enterprises; in fact, the company may have not gotten its start years ago if not for Kim’s ‘nudging elbow’ that inspired the sale of the first four jumpsuits. * I wish also to thank Kim for sending along her photos which add a charming personal touch to Butch's interview. Best regards, Carolyn. *The story of Butch's first sale that is on Page 3 of his biography that is linked at the end of this interview. Q. What was it about Elvis’s jumpsuits that intrigued you at a very early age? A. The artwork that was on them was the first thing that always caught my eye. Being an art fanatic, I could appreciate the workmanship that went into the detailing. The fact that a lot of his jumpsuits were theme driven also intrigued me. The way Elvis carried the costumes themselves, more so the jumpsuits than the two piece stage wear, made him look like a Superhero. Butch Polston in one of his first four suits he sold. Photo Credit: Kim Polston. Q. What are the greatest challenges in making jumpsuits? A. Getting them to fit people that may be thousands of miles away, and the customer not understanding how to take their measurements is one of the most difficult parts. You must have the right measurements from the start in order to make the suit fit properly. A second challenge is making all the suits look like Elvis’s, when not everyone is the same size as Elvis. Also, getting customers to understand that when we send them a belt template, they need to make sure to keep the buckle template on the belt when marking it, instead of overlapping the belt and then putting the buckle in the middle—doing this adds 7” to the length of the belt. Lastly, getting the stud, stone and buckle manufacturers to get us our supplies on time. Back in the 80s and 90s it was easy, as there were a number of places that made these items here in the US. Now, due to so much overseas outsourcing, many of the US companies have closed. The remaining US companies still make a much better product than any other companies around the world. It’s not because I’m lording the US over other countries’ heads. I’ve looked at overseas products because they are so much cheaper and could allow me to make a less expensive product, but the quality is not there. Calf length Eagle Cape by B&K Enterprises. Photo Credit: Butch Polston. Q. What is the most requested jumpsuit? A. By far, it is the Aloha (Liberty Eagle) jumpsuit. The worldwide telecast made it the most famous suit in Elvis’ wardrobe. Q. How has your clientele changed over the years? An early photo of Butch and Kim Polston's son, Michael. Photo Credit: Butch Polston. A. It has not changed a lot. The people who come to us know from the beginning that they are going to get the best quality product on the market, and that we stand behind what we do. We have more women and children’s costumes now than in past years. We have also done over 30 movie projects and over 26 TV projects, most of which had Elvis themes, plus some country and rock singers and even items for some A-list celebrities who are big Elvis fans. Q. Approximately how many costume requests do you receive in one year? A. It changes from year to year, so that’s a difficult question to answer. Every 5th anniversary is when we get the most orders. We have had years when we’ve done as many as 300 costumes. Some of those are for charitable events to raise money. Q. How many orders do you fill in one year? A. Again, this would be a hard one to answer, because it would depend on whether you are inquiring about just Elvis costumes, or all the other recreations of his garments that we make, including 2 pc suits, shirts, vests, jackets, pants, and even costume jewelry. Q. What valuable lessons did you learn from your parents that you still use in your daily life? Kim Polston with son, Michael, in his first jumpsuit, 1980. Photo Credit: Butch Polston. A. A few things I learned from my parents are honesty and integrity, to be respectful to my elders, and to treat women with the utmost respect, to never steal from others, and if you’re going to do something that someone else has done, always ask for permission, and to make every effort to be a good husband to my wife, to be a good father to my child. My mother had a thing about making sure me and my two brothers kept our rooms clean. My late mother told us “I’m not sending you out into the world so that some woman can take care of your lazy backside. You’re going to pull your weight and respect the woman you’re with!” In the final analysis, we were very poor as children, but I had wonderful parents who gave us so much love, we didn’t know we were poor. Q. What has surprised you most about the ETAs you have met? A. Nothing really. I’m amazed at their dedication and their love for Elvis. Those of us who loved him and are big fans of his are a bit like one big, dysfunctional family. LOL! In truth, people are just people, whether they are an ETA, a rock star, movie star, or a ditch digger. Q. How do you spend your time when you are not at work? A. I’m a huge movie and documentary lover—more documentaries than movies, as my brain doesn’t stagnate when watching documentaries. I love knowledge, and even at almost 61 years old, I love to learn new things. Documentaries are right up my alley. I also love to read and study history in detail. One of my joys as I’ve gotten older is finding time on Saturdays, after running errands all morning, to take a nice nap to rejuvenate myself. Q. If you were to design an original Elvis jumpsuit what would it look like? Butch Polston and Bill Belew, costume designer. Photo Credit: Kim Polston. A. I don’t know if I understand this question correctly. I can tell you, we have designed a great deal of custom “Elvis” themed outfits for ETAs, some of which are quite elaborate. One ETA had Gene design him a custom Elvis jumpsuit, and he loved it so much that he had the design painted onto his car. He loved the design so much that he got it in white and in black. If you’re asking if we were designing costumes for Elvis today, what would they be, they would still have the element of “wowing” people, but for a man in his 80s, they would be very elegant, but they would not be jumpsuits. If Elvis had lived, I truly believe he would probably have gotten burned out on the jumpsuit look by the 1980s. I can assure you that they would still have the element of blowing his fans out of their seats. Q. What is the greatest number of costumes that you have sold to one customer? A. The largest order we received was for the movie “3000 Miles to Graceland”, with Kevin Costner and Kurt Russell for head costume designer, Mary McLeod, who jobbed us to do the project. We manufactured 29 costumes in 6 weeks, which almost killed us. But for the standard ETA, about 10-12 at one time. However, we do have one customer who is a collector, from Indianapolis, IN, who owns just about one of every costume we have recreated to date. Gene Doucette at the Louvre. Photo Credit: Butch Polston. Q. If it were possible, what questions would you ask Elvis about the costumes he wore, particularly the jumpsuits? A. Since I know the original designers, and they are like family members to us, both of whom were our son’s godfathers, I pretty much know everything in the discussions about the costumes that went on. I even have notes and documentation that I’ve taken from them over the years to confirm some of the stories. I think I’d probably ask him how he felt about carrying around the weight of the garments. Some of them had so many jewels and studs on them that they were quite heavy. Q. With the advances in technology since you began your business, how has the process of making Elvis costumes changed for you? A. I would say it’s given us a reach to a broader market worldwide. Other than that, we still use the same techniques that were used to make the original costumes. Q. What can you tell us about the making of the documentary, Elvis – Fit for a King? Is there a connection to Canada as suggested by the byline BKEnterprisesCanada? If not, please explain the use of the word ‘Canada’. Gene Doucette and Andy Dumas during the filming of "Elvis - Fit for a King" documentary. Photo Credit: Butch Polston. A. The documentary was made by a gentleman named Andy Dumas, that I was good friends with. He is a stage actor, TV personality in Canada, and he also made documentaries based on some fitness books that he and his wife, Jamie, wrote. He came to me and told me he thought that the story of how we got started into this and created a market and helped create the concept for the contests would make a good documentary. I told him that it would come off like I was trying to brag about something that someone else created, and that it should be more about Bill Belew and Gene Doucette than B&K Enterprises, because the story, in my mind, was truly about Elvis, Bill, and Gene. I really didn’t feel comfortable doing it. Andy really had a passion for the project, so he hit me in my weak spot, which convinced me to do it. My weak spot was, in 1999, my most beloved wife, Kim, was diagnosed with breast cancer. I became passionate about wanting to find a way to help people that could not afford treatment to get it. He suggested we make the documentary, and donate the proceeds after his expenses were covered for making the documentary to the Kentuckiana Cancer Research Foundation. Of the proceeds raised by this organization, 50% go into research and development of new tools to fight cancer, the other 50% goes to a special fund for treatment of patients without health insurance. After a period of time, Andy would then put snippets of the documentary on the internet. We sold a few hundred of the documentaries and raised a fair sum of money, which we donated. It was also shown on what used to be the Documentary Channel, and different local independent affiliates around the US picked it up. The Canadian web site was something Andy created for us to keep interest in the documentary and also to help sell our products. Q. Why do you think ETAs choose your company over others to make their jumpsuits? Bill Belew in Rotterdam. Photo Credit: Butch Polston. A. We were taught by the people who made the original costumes. I single-handedly created the market for these costumes, as when I started there were only about 15 Tribute Artists worldwide. As an old commercial for a television used to say “the quality goes in before the name goes on”. We will do our utmost to make our customers happy and satisfied, and we stand behind our products. The ETAs all know, if they want the best costumes on the market, if they come to us, it’s like coming to the original designers—after all, the man who did the embroidery on Elvis’ costumes is the man who does the embroidery on their costumes! How much more authentic could you get? We’re not in this just to make money. We’re in it because we love what we do. We love the people we deal with, and we feel it’s our way of paying tribute to Elvis and to Bill Belew and Gene Doucette. Q. Have you ever refused to make a costume for a customer? Please explain why or why not. Michael Polston working on a new Web Cape. Photo Credit: Kim Polston. A. Yes, there have been a couple of occasions. A couple are rather sad. We were making costumes for a few different ETAs, who we later found out were using our costumes to take patterns from and starting their own costuming business, or helping to set someone else up in business by letting them use our costumes for patterns in exchange for good deals on costumes. Unfortunately, this still goes on to this day. That’s why the market is oversaturated with bad copies of our products. Also, there were times when we turned orders away when the customer requested a costume for a specific deadline that we simply could not meet. I have also had very young ETAs come into our shop, and once they saw our display room, they would pick out very expensive costumes. I talk them out of buying the expensive ones until they become more seasoned and get big enough not to grow out of it quickly. I think it’s wonderful that young people are keeping Elvis’s legacy alive by doing an Elvis tribute act. However, I feel that it’s ripping the client off by selling them a very pricey costume that they are going to outgrow, or that once they get into this they may find that they really don’t want to do it after a period anyway. So, I try to get them to start out in simplistic outfits that are less expensive and work their way up as they grow. Unfortunately, there are those out there making costumes, without scruples and try to fit these kids into the most expensive thing that they make. Q. What is the most unusual request that you have received regarding the making of a customer’s jumpsuit? Kim and Butch Polston's Aunt Gayle working on jumpsuits, early 1990s. Photo Credit: Butch Polston. A. That can be a long book in itself, LOL! We’ve done costumes for people to get married in, for people to be buried in, to wear for Halloween, and we did Elvis jumpsuits with company logos. We have manufactured capes for military groups overseas that hang in their barracks. EPE asked us to manufacture two eagle capes and two eagle belts which they gave to George W. Bush and the Prime Minister of Japan when they visited Graceland. We were requested to make an Eagle suit, cape & belt for President Bill Clinton’s presidential library. Both presidents have had their Elvis items on display. Whether they are still on display now, I don’t know. There are some personal things that I won’t put into print that people have requested, but let’s just say one outfit was for fertility purposes, LOL! Q. Do you still travel to do a fitting? 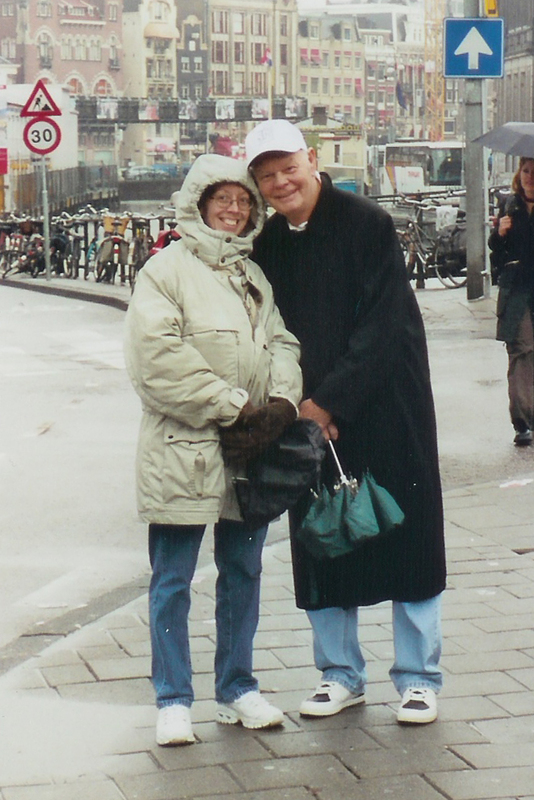 Kim Polston and Bill Belew in Amsterdam. Photo Credit: Butch Polston. A. On occasion—especially if the client is willing to pay my travel expenses. I’m always happy to try and work with them. In the days when airline tickets weren’t so expensive, we would work the personal fitting into the price of the garment if they wanted it, and I would travel to do fittings (in the 1990s). Most customers from other countries prefer to fly into Memphis so they can see Graceland, drive the 5 hour drive up to visit with us and get their fitting done, then drive back to Memphis—or fly out of our local airport that same evening. This has become more of the occurrence. Q. How do you ensure that a client at a distance who orders online receives the proper fit? Bonnie Jonus working at B&K Enterprises. Photo Credit: Robin Theobald. A. If we are provided with good measurements and good detailed pictures, there are usually very few problems. We have a detailed measurement chart, which we use to make the customer a pattern. We send a fitting suit for them to try on and send us photos of themselves wearing. Once we get the fitting pictures, we ask them to pin any loose areas, and the sleeve length and pant leg length. Usually this is all it takes. Once in a while, if the fitting needs a lot of adjustments, we will send it back for a second fitting after we have adjusted it. Q. Have you made costumes for an ETA who has the exact measurements of Elvis? Kim Wein, B&K Enterprises head seamstress for close to 20 years. Photo Credit: Kim Polston. A. No. There are several who are close to Elvis’s size, but out of the many thousands of customers, we’ve found that really, no two bodies are exactly the same. They can be close, to the point that they can sell their used costumes on eBay and someone else can buy and easily fit into it. That’s one of the reasons why this is an expensive undertaking. Q. Are all aspects of making jumpsuits and other costumes still done solely at your business location in the US, or are some jobs sourced out? A. Yes and no. All the costumes are manufactured here in the US; however, if you buy an embroidered suit from us, Gene Doucette (the man who designed Elvis’s original embroidered suits), does our embroidery. He lives in California. So, while it is still made in the US, it’s not all made in one facility. Q. What is the most difficult jumpsuit to make? How many hours do you estimate goes into making this particular jumpsuit? Gene Doucette and Butch Polston. Photo Credit: Kim Polston. A. There are a number of them that are equally difficult to produce because of the studwork and precision detailing of the embellishments. The embroidered suits actually take the longest, because they are not done on a computerized multi-head machine, nor are they sewn on like a patch. Gene stamps the pattern on the garment and does the embroidery work. Those suits can take up to 240 man hours to produce. A cheap patch style knock off only takes a day or so. The way we do the embroidery, the stitching is done right through the garment, one chain stitch at a time. Then the embellishments are added, topping the embroidery with rhinestones and studs, and can take a number of hours, depending on the suit. We do this at our shop. Even though a great deal of the suits are time consuming, if you’re not going to do it right, you shouldn’t do it. We promised Bill and Gene that if we were going to use their artwork, not only would they be paid for that usage, but it would be done right—the way they did it for Elvis and other entertainers that they did jumpsuits for. Q. What advice would you give to anyone thinking of starting a garment making business? LuAngelia works on a costume. Photo Credit: Robin Theobald. A. In these days and times, I would suggest not to. Even though our suits are expensive, because we do top quality garments, people can believe what they want, but there’s not a lot of profit in it. There have been weeks when Kim and I couldn’t write ourselves a paycheck. After you pay your labor expenses, your material costs, your taxes on you and your employees, health insurance coverage, building rental, and all the other expenses, at times you’re lucky to break even—especially when there are so many people saturating the market with cheap knock offs. If you’re talking about garments as a whole, other than just Elvis garments, it’s foolish to even get started into it, because of all the cheap items that are now made in China and other Asian countries. Unfortunately, a lot of young people suffer in the Asian countries working because they’re not paid a decent wage and are taken advantage of. Growing up in the US as a child, there were people who did tailoring work everywhere. Now, because of all the cheap garments that are made, we live in a disposable society that’s made it easier to go out and buy a new garment than to repair the old one. This outsourcing has killed many generations of different aspects of the clothing industry as a whole. The only thing I could tell anyone that’s interested in fashion, that comes up with an idea for a unique product that’s never been seen on the market, is to take your idea, jump on it, run with it, and get off of it, and not to expect longevity in it. No one in the world has an original idea in their head, so you can bet, if you are that person, a number of people are going to steal your idea, have it produced in some sweat shop, and you will be left with a great deal of hurt and unhappiness. Unfortunately, we live in a world where you only get rich off of the other guy’s sweat. When that other guy becomes someone overseas that utilizes children for cheap pay so they can get rich, there’s no hope for a decent market. Q. Do you attend any ETA concerts that are not related to business? What are your impressions of tribute performances? At the Hacienda in the early years. Photo Credit: Mike McGregor. A. In the early years we used to attend a number of ETA concerts, but most of them were our customers inviting us to the shows. Or, it was individuals who were someone else’s customers that were not happy with the competitor’s product and wanted us to come to the show so we could watch them perform and tell them our views on their garments (critique them). However, I started also going to large venue concerts with lots of different famous entertainers, and would go back stage and watch the shows. After a while, it started to catch up with me. One year, I was home 10 weekends out of the whole year because I was either going to a professional entertainer's show, or an ETA’s show. In my 30s and 40s and even early 50s that was fun to do and I enjoyed it all. When you hit your 60s you start to run a bit out of steam. So, now even though I’d love to still take in their shows and am still invited to shows, I tend to prefer to stay home, relax, cuddle up with my wife and dog, and watch a documentary. Q. Are you able to tell from a distance that an ETA whom you have not met is wearing one of your costumes on stage? How? Karol Tomes working at B&K Enterprises. Photo Credit: Robin Theobald. A. Yes, I can certainly tell our suits on stage, by the cut of the suit, and also by the quality of the materials used on the suit (such as the rhinestones). We use a very expensive grade of Austrian rhinestones. Others tend to use an inexpensive brand made elsewhere. The Austrian rhinestones have more brilliance, like a diamond. Another way we can tell if someone copied Gene’s work is, Gene did something using his artistic talents that most people are not aware of. In most of the elaborate suits he designed, he embedded his initials, which is his trademark, into the incorporation of the design. There are only 4 people alive that know how those initials are incorporated into the designs. That’s how we win court cases if we take someone to court for stealing our products, because not only are they violating our Intellectual Property Rights, they are also violating Gene’s Artistic Rights and Trademark. Q. Please describe your experiences at the recent Birmingham competition. Were you there for business or pleasure? Please explain. A. We have worked with Michael (Cawthray) King for many years to set up a display of our costumes and other products at his shows. Everyone has always treated us with a great deal of dignity and respect. We have a number of ETAs there that are our dedicated customers. We are so extremely proud to have them as part of our B&K family. It’s always a joy when we have the financial means to do that show. Robin Theobald, Kim's assistant. Photo Credit: Kim Polston. A. We love what we do. I had a plan worked out so that I could retire at 65, unfortunately, in 2008 when the market bottomed out, it destroyed our retirement accounts. We were on track to either let our son take over the business, or sell out. I do not know at this point where the road is going to lead us. I must say, it’s not that I don’t enjoy what we do and the wonderful people we do work for, but I’ve been working, doing everything from cutting grass, to painting houses, to everything in between, and now making Elvis costumes, since I was 13 years old. I helped my parents out as a child with earning my keep, so it’s more a matter of at 65 I just wanted to do some things I’ve always wanted to do in my life, other than just work all the time. Q. What are your plans post-retirement? A. If I ever do get to retire, I would love to write a couple of books about some historical events and go to a local art school and learn to paint. I always wanted to build a little cabin in the Great Smokey Mountain region, in Tennessee, and spend my spring and summers living in the cabin, painting and reading. I’d spend my winters writing. 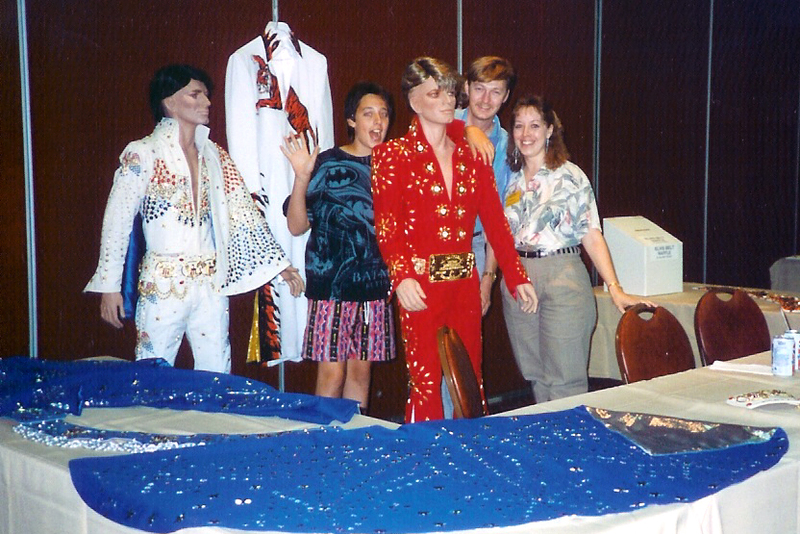 The funniest part of all of this is that I started this business because all I wanted was one of Elvis’s original costumes to hold near and dear to my heart all my life, as he was my hero. I’ve never been able to afford one of his original jumpsuits, but had I been able to have gotten one back in the early 80s when I was researching them, I would never have started this business in the first place. Q. What are your hopes for B&K Enterprises after you retire? Butch and Michael Polston. Photo Credit: Kim Polston. A. That will really be up to our son. He’s 38 years old, and has been helping us in designing these garments since he was 6 years old. It is definitely a legacy that’s worthy of passing down to someone. However, as he’s getting older, he’s more in the mind of perhaps with people saturating the market and the prices of materials being so costly, once we decide to retire, it may be a good time to sell the business to someone with the same fire and passion that we had when we started it. Q. Is there a question that I should have asked, but didn’t? A. As I stated earlier, the business started as a fluke. I had no intentions of making Elvis costumes for a living. When I found out Elvis had passed away, my wife (who was then my fiancée), one weekend when I was home on leave from the Army, asked me “If you could have anything that Elvis owned, what would it be?” I said, “One of Elvis’s costumes.” Had I been able to afford one of his suits back then, I would have never started this business, and this article would have never been written.